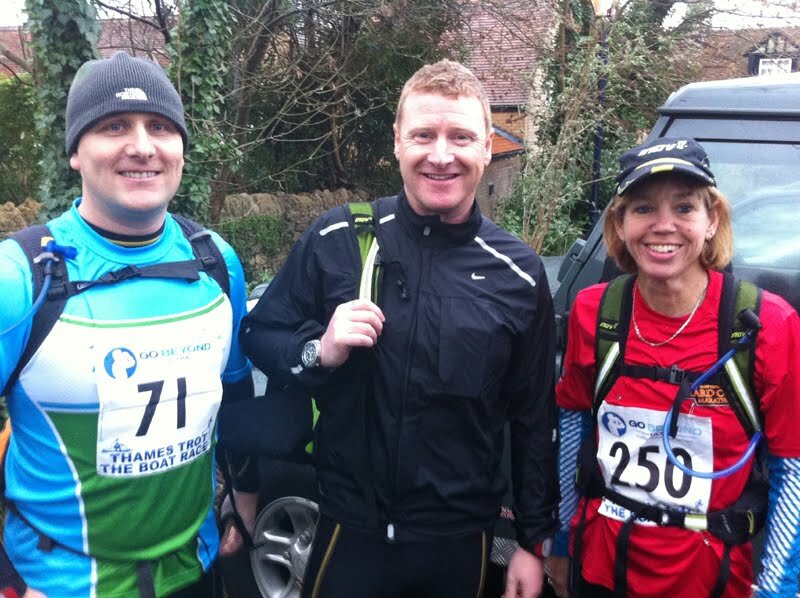 Myself, Stouty, Sue and Shane all took part in the Thames Trot race, a 50 mile run from The Prince of Wales Pub in Oxford to Henley following the Thames Path river. It appeared there were a lot more competitors than in previous years as the pub was packed and the majority of people were waiting outside ready for the start. You do start to see the same faces taking part in the Ultra races so there were a few acknowledging nods towards a few people they recognised from the Druid Ultra a few months ago. 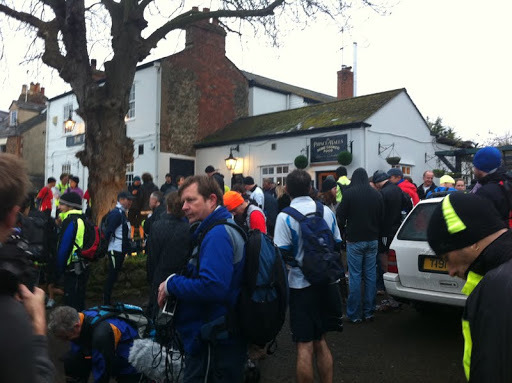 The start was delayed by a few mins to allow for a few late arrivals and everyone set off at 8.40am following the path down to the river with the instructions “Follow the river and don’t stop until you get to Henley!”. There was a lot of grouping along the first few miles until the race began to spread out. Stouty had ploughed on ahead whilst myself and Sue followed and Shane was close behind. The weather was cool and a little wet at first although the wind was quite noticeable and at times there was a strong headwind for the early part of the race although this seemed to settle down where some of the river route was les exposed. The route was a little muddy at points but not as bad as it had been a few weeks earlier. Sue and I arrived at the first checkpoint at Culham together with Stouty a little ahead and Shane a little behind and they pressed on to the second checkpoint at Benson where they refueled quickly and headed off again. However, within a couple of miles they spotted Stouty ahead and decided to put in a short burst to catch him up. Thankfully, Stouty did them a favour and slowed down unfortunately he had pulled up with what looked like a ham-string injury. After some running repairs (ibuprofen and a stretch) the three of them set off together. However, it was clear Stouty was struggling and he decided to adopt a run/walk strategy and keep going at the best pace he could so we pushed on ahead toegther. At the 22 mile mark or so, Sue pushed on ahead as I slowed and I was pleased to eventually see the Goring checkpoint at 28 miles. Sue had already continued on ahead at this point and was probably 20 minues ahead so I stopped for quite a bit to eat. The food stop here was plentiful with the strongly flavoured salt and vinegar crips going down extremely well with the pre-packed sausage sandwiches. I was just about to leave after a 15 minute stop when Stouty turned up at the checkpoint and he decided to wait and run with Stouty. The boys were joined by buddy Nina who was going to run with them for a while. At this point Shane, had the cunning plan of joining his wife for a meal at a cafe nearby so and he took an extended break at this point to refuel (and no doubt consume a glass of wine). The reason we knew this as we spotted his wife in the cafe just as you crossed over the bridge at Streatly. 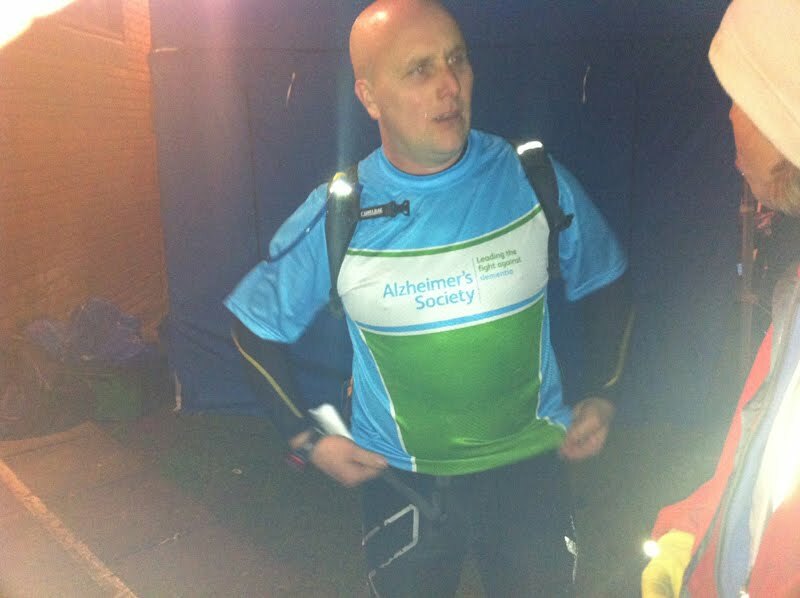 We continued on but it was a stop and start effort as Stouty needed a bit of treatment on his legs (you may have heard the screams as you ran past) but they arrived at the checkpoint near Mapledurham together after probably the slowest leg. At this point I decided to press on ahead otherwise there would be no chance of achieving his planned time and he set off at a trot and ran consistently until the Sonning checkpoint passing a handful of people on the way with Stouty accompanied by Nina electing to revert to the run a mile/walk a mile strategy. Shane was probably enjoying his second glass of wine in Streatly at this point whilst Sue was pressing ahead past the last checkpoint at Sonning and then onto the finish. As I arrived at Sonning it was starting to get dark meaning competitors have to take care with their footing. So after a quick walk for a mile or so, I started to break into a jog to the finish. 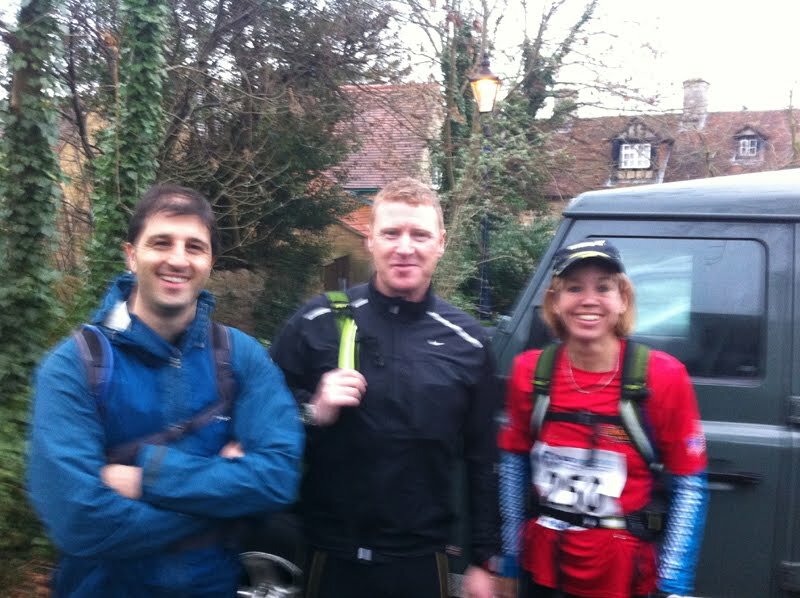 Sue had finished by now and had arrived in Henley a good time of 8hrs 25 mins in her first 50 miler. I came in a little while later at 9hrs 16mins which was a new PB and 40 mins quicker than last year and was delighted with the time. 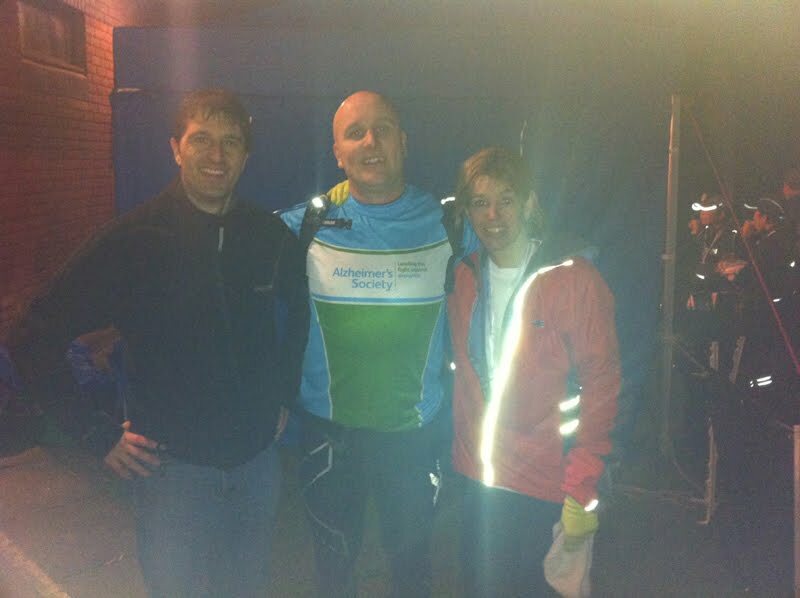 Stouty (accompanied by Nina) came in around the 10hr mark cursing his injuries but pleased to finish and Shane arrived around the 11hr mark. We decided to treat ourselves to fish and chips at a local shop (which went down well) before heading home. The race organisation was good, despite more competitors this year the water and snacks were plentiful and things like directions and kit transport all went smoothly. More of an effort was made at the finish with a finishing “straight” and it was good to see a few more supporters along the way which is always encouraging. There were hot drinks and snack at the end. For your £40 entry fee, you received a medal, long sleeved technical top plus food, water and support at each checkpoints so its not bad value for money overall.